I have a slight obsession lately with S'mores. I have been working on some recipes for a client and one of the recipes was a S'mores cheesecake (I'll let you know when and where that recipe is available). Then this morning I was up early and felt the need to make something. First of all I was thinking a banana loaf but suddenly realised I didn't actually have any bananas. I did have a Kilner full of milk chocolate chips, one of dark chocolate cadets, one full of marshmallows and a biscuit jar of broken biscuits. And let's be honest anytime is a good time to weld the blowtorch even 7am on a Friday morning ! Start by gently melting the chocolates in a large bowl either over a pan of simmering water or in the micro. Line your brownie pan with parchment, using a third of melted chocolate pour a layer into the pan, add half of the broken biscuits and a third of the mini marshmallows, cover with a third of the melted chocolate. Repeat the process, finish with the remaining marshmallows. 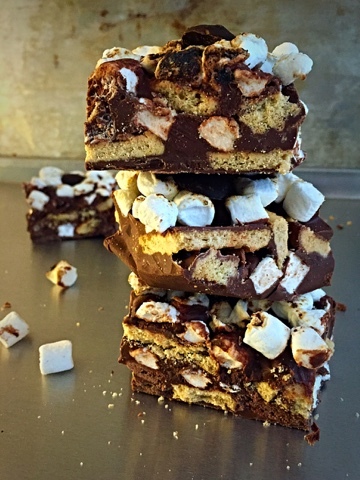 Place in the fridge for at least 60 minutes, now using a kitchen blowtorch burnish the marshmallows gently, cut into 9 squares, and set in the fridge for a few minutes to firm before serving.